Every year I usually make the traverse of the Cairngorm Plateau from Cairn Gorm to Ben Macdui at least once as it’s my favourite ski tour. Despite the many weeks snow has lain on the hills this winter and spring it seemed as though this year would be one when the right conditions eluded me. Each time I set off I met a combination of strong winds, minimal visibility and blizzards that had me turning back. The Cairngorm Plateau is high and exposed, a little piece of arctic tundra, and navigation can be difficult and travel against the wind impossible in a big winter storm. Cliffs and avalanche prone slopes rim the plateau so finding the right route is essential for safety. I’ve skied across the plateau in a blizzard and it’s a slow, hard journey. I have no wish to do so again if it’s not necessary so on each venture so far this snow season I stayed on the northern edge of the plateau and only spent a few hours high up. Waiting for the right time and weather is always worthwhile but when April arrived I thought that the opportunity for this year had passed. I certainly didn’t think that it would arrive as late as April 21. However late April came and the snow still lay deep on the hills. As always I was watching the weather forecast day by day and noting that although pressure was high and temperatures cold there was a strong east wind and much cloud, not the right weather for an enjoyable ski on the Cairngorm plateau. I did make a trip on skis into the Monadh Liath, the grey hills on the far side of Strathspey from the Cairngorms (originally the Monadh Ruadh – the red hills), and the strength of the wind on these lower hills was enough to make me glad not to be any higher. Then came the forecast for April 21 - lower wind speeds and a possible cloud clearance late in the day. Trusting in the predicted timing I set out at 2.45 p.m. as the skies started turning a deep blue and the snow began to shine in the strengthening sun. A few people descending passed me, stomping down through the snow towards cafes and bars and indoor warmth. By the time I reached the plateau it was deserted and I had the whole white cold world to myself. 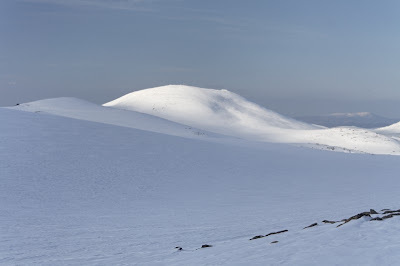 The ski to Ben Macdui was a delight, with more snow than I remember for many years. Sections that are often rocky, such as that from Stob Coire an t-Sneachda down to the col with Cairn Lochan were white and firm, beautiful spring snow on which to make turns. It was 7 p.m. when I reached the summit of Ben Macdui and wandered west to the edge of the summit dome and the tremendous sight of Cairn Toul and Braeriach rising out of the depths of the Lairig Ghru and An Garbh Choire, one of the great views of the Scottish Highlands. Leaving the summit I meandered back across the plateau as the sun sank low in the sky and blue shadows were cast across the snow. A descent of Lurchers Gully on now refrozen crusty snow was entertaining in the fading flat light, as was the zigzag route round bits of open water, scraps of bog and boulders and clumps of heather as the snow slowly ran out. Finally linking ever smaller patches of snow became too difficult and I walked the last half mile back to the car as the first stars appeared in the black sky. Cairn Gorm from the lower slopes of Ben MacDui, late in the afternoon on April 21. Photo info: Canon EOS 350D, Canon EF-S 18-55 mm IS@ 51mm, f8@1/125, ISO 100, raw file converted to JPEG in DxO Optics Pro.